It’s a Minecraft kind of week (year!) 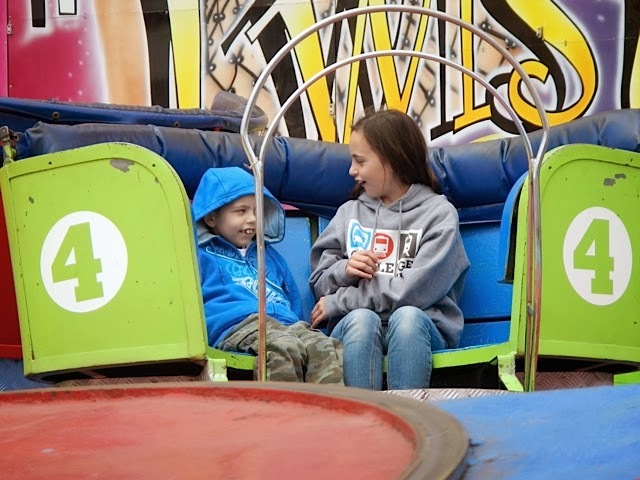 Another friend brought her children in who both love MC and they sat and played with Rafael whilst he had chemo :-) The 1 ½ went by very quickly!!! Received another email from Rod today. 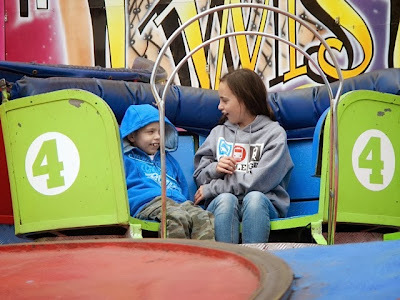 I get it that he really wants to try more PRRT, but our hands are tied and we have to go with Dr Michael’s plans until we know if we can use Rafael’s stem cells. Rod is just presuming we can and I’m trying to make him understand that Michael is not against it, but if we are going to use a “big gun” then we really need to consider all of the options and that might include adding a chemotherapy into the mix. 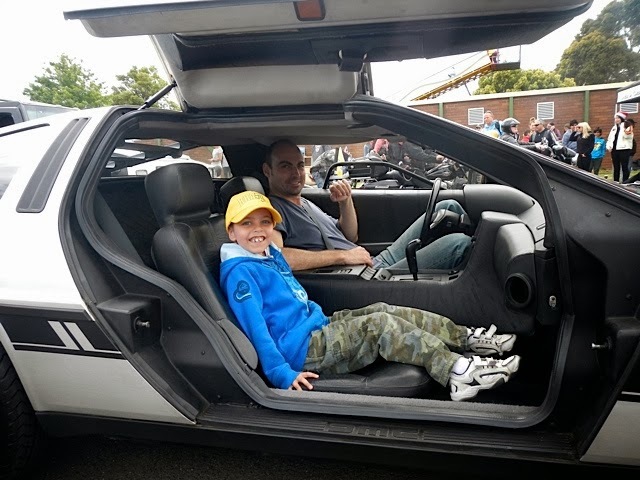 It was very quiet – they both sat watching Minecraft videos on their iPads and I read my book. I don’t think anyone spoke the whole time! I thought that chemotherapy could be brought forward by 2 hours a day, but it’s actually 2 hours for the cycle. That meant that we’d only be able to start as early as 9 am on Saturday, 1 hour later than I hoped. Theresa spoke to Dr Michael and he said bringing it forward an extra hour would be ok. Therefore, she wants us to come a bit earlier each day until then, which means driving in peak hour traffic! 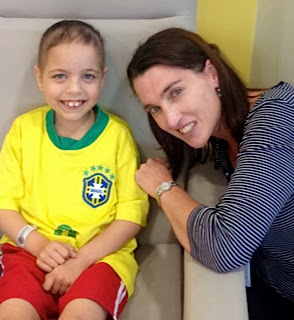 We had our scheduled 45 minute meeting with Dr Michael at 2 pm and Rafael finished chemo at 12:30. It meant us hanging round for a while, but it was ok. Rafael has a new passion – chicken teriyaki! Except he only eats the chicken and leaves the rest. Oh well, it’s only $8.50, probably McDonalds costs almost that much! On Monday when I saw Michael, he told me that he had the GaTATE report but not the mIBG one. I wrote to Dr Tim (as Rod is away) and asked him to forward it to Michael before our meeting today. As it turns out, he still doesn’t have. But, over the last 2 days, Rod has been emailing us and he went into the office today (he’s on annual leave) to review both of Rafael’s scans and then he called Michael personally this morning! Rod is still reporting it as minor response. I had to remind him that Rafael hasn’t had any aggressive therapy yet and it was only the last cycle that Irinotecan was put up to the MTD (maximum tolerated dose). 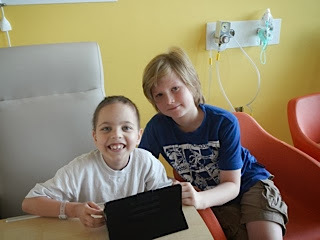 Rod really wants to try to get Michael to agree to try using a combination of Lutetium and mIBG therapy at a high dose with stem cell support. Michael is not against it, however, he really wants to try other options first. He brings his point across quite validly. 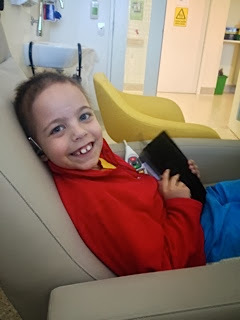 He thinks the Peter Mac option is not curative and he is really trying to cure Rafael or at least give him a much better chance of getting on to the anti body trial or some other trial. The BMA’s showed that 1 side is clear and the other still has NB cells. 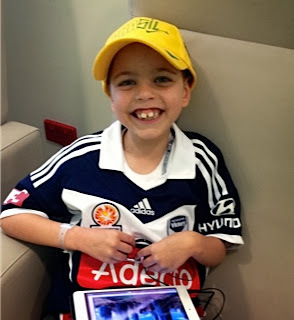 At that level, it means he qualifies for high dose chemo, as well as other trials. We talked about many options today and nothing is set. 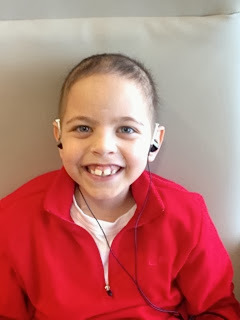 We are going to a test in a couple of weeks to see if Rafael is producing stem cells. If so, we may be able to harvest more. Also, they need to check the ones he has frozen (2 bags) to check their viability and there’s 1 other test for them to do – it’s to check whether the stem cell swill be able to graft to Rafael’s “unhospitable” marrow. So, no new plan is set yet. We seem to repeat a lot of conversations with Michael! However, the next cycle of Irino/Temo will be a “proper” cycle, as per the clinical trial. 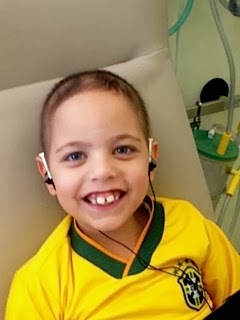 This means he will have oral Temozolomide (100mg) on Days 1- 5 and IV Irinotecan (50mg) on Days 1 – 5 & Days 8 -12. The next cycle will start on 16th December; therefore it means we will have to do to the ward on Christmas Day for 1 ½ hrs for the chemo infusion. It’s not so bad, as we celebrate on Christmas Eve anyway, we’ll just have to let Santa know what time we need to leave. Kane came back to our house afterwards and they continued their Minecraft passion! Had to be at RCH by 10 am for the GFR tracer to be injected. Brooke did a great job getting a canula in Rafael’s arm 1st go! We also asked her to take some blood for the pre chemo check up. Due to start this afternoon after the blood tests for the GFR were taken. We went up to Day Oncology to wait. After the GFR tracer, they need to take blood at 1 ½ hrs and 3 hrs. Thankfully I spoke to Theresa about getting the chemo organised. I need to give him the Temozolmide capsules at least 1 hr before the Irinotecan can start. And it usually takes a while for pharmacy to arrange that! Theresa asked which doctor we usually see pre chemo? Actually, no one in particular, usually just the nurse coordinator check the blood counts and then gets one of the fellows to sign off on it. Anyway, Michael was there and she grabbed him! He came in to review Rafael. He thought that he had written the chemo order already, but no one could find it. Long story, he had – but for next week! 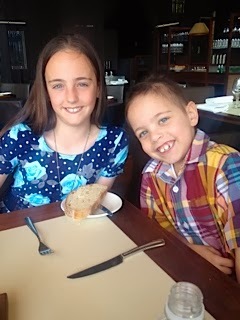 First off, we went to lunch at Rockpool Bar & Grill. I had a $100 voucher and 2 of my friends from work donated their own vouchers to us, so we had $300 in total! 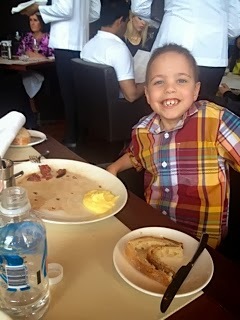 Rafael order a wagyu skirt steak and ate it all!!! Dom and I both had fillet steaks and side orders of vegetables. The meal was divine, mouth watering and above expectations! We also let the children have anything they wanted for dessert and Rafael was lucky because they did allow ice cream by the scoop! We took a bottle of water with us and kept getting Rafael to drink it throughout the day as he’s having his kidney test tomorrow and we wanted to make sure he’s well hydrated. The reservations manager at Rockpool knew that we were going to the cinema after lunch. Before we left, the waitress gave us a large bag that had many individual bags of all they different types of petit fours they sell! 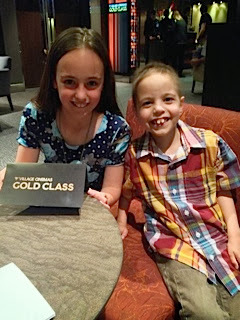 Next we headed to the Gold Class cinema to watch Catching Fire. We have been looking forward to seeing it, but no one more than Gabriela! She has read the books over and over. The staff at Williamstown Grammar had very generously given us $200 vouchers to use. As we’d just eaten lunch, we didn’t need to order any food. Instead we had a glass of wine and a coffee! In total, our wonderful day out cost us $47!!!!!!!!! 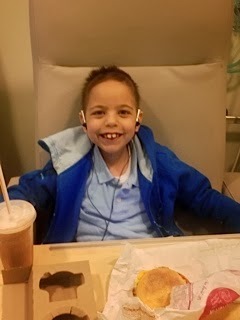 Yeah – Rafael made it to school today! Rafael’s teacher is away for the rest of the term as she has been very ill and was admitted to hospital. 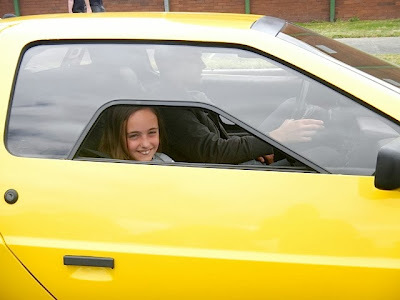 It will be sad to finish our time at Williamstown Grammar without her there :-( She has looked after Rafael so well this year, just like he’s her own child :-) The good news is that she will be teaching at the main campus next year, so Rafael will still get to see her!! At RCH today for Bone Marrow Aspirates. They do it on both sides of his back and they also take some of the trephine (bony part of marrow). I spoke to the anaesthetist before about changing his anaesthetic now that he’s getting a bit older. She agreed and they left out the morphine today. It took a while for them to call me into recovery, but that’s normal as it usually takes him a while to wake up. The nurse and I kept trying to get him to wake up, but he’d open his eyes and then just get comfy again and nod off. A couple of time the nurse had to call a Dr because Rafael’s blood pressure kept dropping too low. At one stage they were talking about putting in an IV line and giving a bolus of fluids. The nurse and I managed to get Rafael to sit up a bit and drink water through a straw and slowly his blood pressure came up. By the time we left, it was still low, but in the low range of acceptable. A couple of my friends came by to drop off some food and whilst Rafael was recovering we were able to have a nice chat. 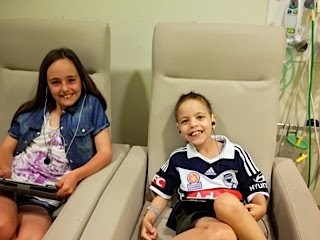 At Peter Mac again today, for the mIBG scan. This one takes a bit longer yesterday ~ 1 ½ hours. 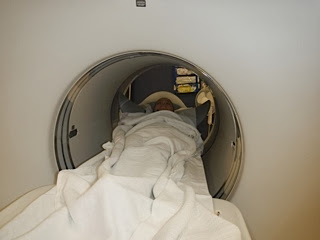 Rafael has to lie very still throughout the scan and he does. He copes very well with all this stuff going on! Managed to have a chat with Dr Andrew, who is a Fellow. I asked him to show me the gaTATE scan and he did. The report states “minor response” but from what I saw, I’d say partial response (PR). Yes, it’s still black and there is lots of cancer, but there were places where the black was greyer. I just didn’t want to see anything that was worse, and this wasn’t, it was a bit better. At Peter Mac today for GaTATE scan and mIBG tracer injection. Prof Hicks is away this week, so not sure if we’ll get the result. 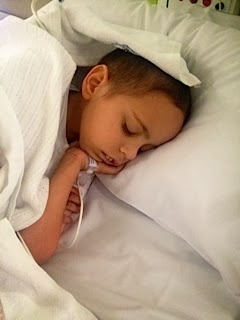 We are not expecting bad news, as clinically, Rafael is doing so well, compared to how he was a few months ago. Jessy was there and she accessed Rafael’s port. We decided to leave it in until Thursday as they can use it at RCH for the anaesthesia. We briefly saw Dr Tim after the scan, but he’s a scaredy cat and never wants to give us bad news. He just said, “Yes, there is still stuff there” !!! 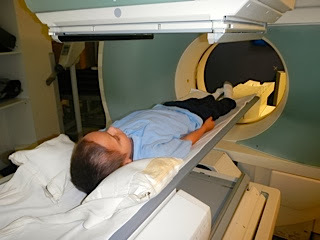 We went up to Nuclear Medicine to have the tracer injected and found out that it is Val’s last week. She has also been there throughout our journey and we’ll miss her. Dom took Rafael in to the ward to get his blood count done and they did a cross match at the same time. Rafael’s best friend Kane said he wanted to go too. We warned him that he’d be bored, but he shrugged and said, “if I’m with Rafael I don’t mind”. Nurse Jessy was waiting for them to get there and the blood results came back quickly. Yep – Rafa was right. So the 3 boys spent the day there. Dom had dropped Gabriela off at a friend’s house as they are doing the Relay for Life tonight. Checked blood counts and then had an appointment with Dr Michael. Before the next round of chemo we are going to get all of the scans repeated as well as both bone marrow/trephine aspirates and GFR (kidney function). He, like us, is very happy with Rafael’s lack of pain and almost being back to his normal self. 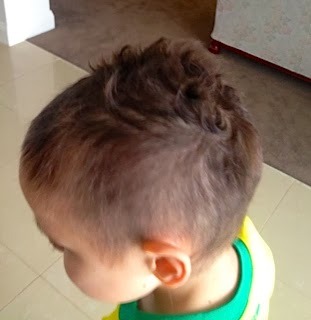 He’s still not kicking the soccer ball around the house – that is our benchmark. Today was the Melbourne Cup holiday and Dom & Lela did the hosp run for me. Day Oncology was closed so they went to the ward. It was very quick, in and out in 1 ½ hours. Next round of Chemo started today. We went in early to get the blood test done and then had to wait about 2 ½ hours for a doctor to sign off on it – grrr!! !